WAIST HIGH: Hacienda The Exhibition. It was a Manchester clubbing phenomenon and now 25 years after it opened, the Hacienda is set to rise again with a summer of international events and launches. New Order bassist Peter Hook is behind Hacienda 25, a series of events to mark the 25-year anniversary of the opening of the legendary super club. 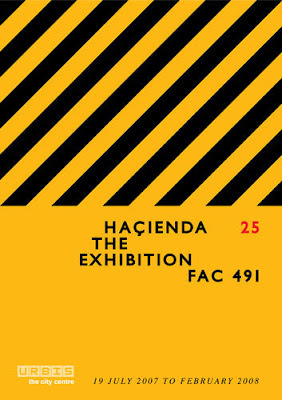 The Hacienda 25 Club Tour will feature classic Hacienda DJs and Factory Records artists. Said Hook, "It doesn't matter where in the world you go, people have heard of the Hacienda, it had such a huge impact on the club scene worldwide." A complete collection of the Haciendas iconic Birthday Posters will be on show for the first time, at the Urbis cities museum in Manchester, along with previously unseen footage and items from the personal collections of Tony Wilson, Peter Hook, Ben Kelly, and Rob Gretton. An invite-only launch party will feature DJ sets by Sasha, Peter Hook, and Graeme Park. The exhibition will run for 7 months and is expected to attract 200,000 + visitors. Hacienda DJs Graeme Park, Justin Robertson, and 808 State will join Peter Hook for the Hacienda Club Night at Sankeys Soap, Manchester, on August 26. Alistair Whitehead and Buckley will play the Shine room in tribute to the regular Hacienda Friday night. Negotiations are underway to confirm acts for a Hallucienda gig later in the year at Manchester's Ritz club, featuring bands from the Hac and bands that have been inspired by the Hac. Other confirmed tour dates so far include a Hac tent at Live at Loch Lomond festival. Other future Hacienda-related releases will include Peter Hook's biography How Not to Run a Club, due for release in Spring 2008. He said, "It's about how the Hacienda spent all of New Orders money or, to quote Anthony H. Wilson, 'how we made history not money.'" The exhibition runs through February 17, 2008.